Manoli’s Jewelers is a founding sponsor of St. Thomas the Apostle Orthodox Greek Festival and the Greek Festival in Springfield MO. 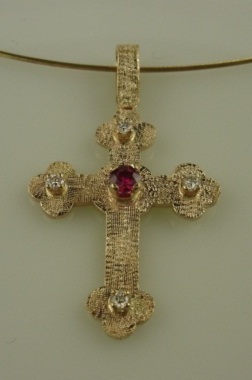 We are donating a handmade ruby and diamond byzantine style cross valued at $1099. You may buy tickets for the cross at Manoli’s Jewelers in Springfield MO or at the Greek Festival on Sept 7-9th, 2012 Most people are buying the five for $20 so with only 750 tickets for sale the chances are pretty good. We would love to see you at the Greek festival in Springfield MO. Hi. We have not been in for a long time. I need to get you to design a cross with rubies or a ruby and diamonds for our 25th anniversary on 6/2/13. I will come in very soon, probably end of this next week to talk. Hope you are well. Great, we look forward to seeing you.